A series of postures performed in a flowing sequence, Sun Salutations are often used as a warmup at the beginning of a yoga practice. But the benefits are far greater than the warmup. Sun Salutations help lengthen and strengthen, and they burn calories to aid weight loss. Research shows that just performing Sun Salutations can improve cardiovascular conditioning, prevent fatigue, promote calm and relaxation and a provide a range of other mental and physical benefits. Even if there's no time for a full practice, a few rounds of Sun Salutations can do a world of good. Mountain Pose: Promotes good posture, strengthens the legs and core, regulates breathing and tones the core and hips. Standing Forward Fold: Lengthens the spine and stretches the back and hamstring muscles. Half Forward Fold: Strengthens the lower back and core, lengthens the spine and stretches the backs of the thighs and glutes. Four-Limbed Staff Pose: Strengthens the entire body, especially the arms, upper back and core. Upward-Facing Dog Pose: Strengthens the entire body, opens the chest and aligns the spine. Downward-Facing Dog: Builds upper body strength, opens the chest and stretches the entire back body. High Lunge/Warrior I: Builds lower body strength, lengthens the spine, opens the chest and stretches the legs and groin. In practice, the poses are performed in quick succession with one breath per posture. Moving from pose to pose without rest builds heat in the body, and most students will start to break a sweat as their heart rate rises. As a warmup, this primes the muscles to become more flexible preparing the body for deeper poses. But Sun Salutations on their own are an effective cardiovascular workout. A 2011 study published in "International Journal of Yoga" found that regular practice of Sun Salutations promoted positive changes in lung function, respiratory pressure and resting cardiovascular parameters. These changes resulted when Sun Salutations were performed quickly rather than slowly. Because they generate heat in the body and increase heart rate and breathing, Sun Salutations are considered aerobic training when performed in quick succession. Any time you get your heart rate up, you're burning calories. Burn enough calories to offset your food intake and you'll burn fat, too. In a study examining the effects of three different types of cardio training -- circuit training, treadmill walking and sun salutation training -- all three methods were found to be effective in managing weight and improving physical fitness in obese female subjects. The study, published in 2015 in "International Journal of Yoga" also reported that Sun Salutations and circuit training were more effective at improving cardio-respiratory fitness and upper body muscular endurance, and only sun salutations improved flexibility. Yoga has long been touted for its effects on body and mind, as a moving meditation and a way to calm the mind and promote harmony. Even a simple Sun Salutation practice can have the same effects as a full yoga practice. 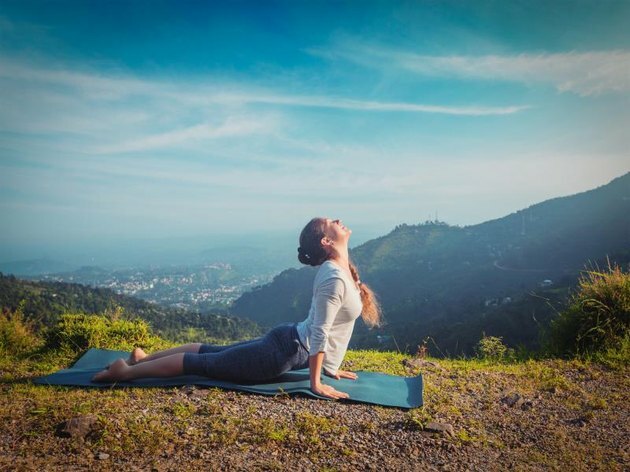 A study published in "International Yoga Journal" in 2015 examined the effects of Sun Salutation practice on stressed out college students in Pune, India. Researchers found that the stressed out students who practiced Sun Salutations for 14 days were more physically relaxed, mentally quiet, at peace and at ease than a control group of students that did not practice. The students who practiced were also more rested and refreshed and exhibited less worry and negative emotions. Read more: What Are the Benefits of Stretching & Yoga?